According to the National Center for Education Statistics, more that 20 percent of eighth-grade students are not able to perform basic mathematical calculations, and U.S. high school seniors recently tested below the international average in mathematics and science. It is also becoming apparent that the number of American students graduating from college with a degree in science, technology, engineering and mathematics (STEM) fields has not been sufficient to fulfill the needs of high-tech companies. Illinois Gov. Pat Quinn visited Aurora University on July 13 and signed into law a bill authorizing the establishment of a STEM Partnership School on campus. The school will involve students and teachers from the Aurora East, Aurora West, Indian Prairie and Oswego school districts, as well as undergraduate and graduate students and faculty from AU. A wide range of business, civic and nonprofit partners are collaborating alongside the four school districts and the university to realize the dream of building a school that will nurture talented elementary school students and act as a laboratory for STEM education methods. The partnership school is one part of Aurora University’s STEM agenda, which already includes several components. AU has been leading an effort to offer after-school and summer programs with a mathematics and science emphasis for middle school students in the community. This summer, more than 100 students participated in the Amazing Science Summer program, a joint effort between the university, partner school districts, City of Aurora and Communities In Schools. The program immersed young students in hands-on science experiments to ignite their interest and passion for careers in STEM fields. AU and its community partners have also been providing professional development opportunities for local mathematics and science teachers for the past four years using Illinois Mathematics and Science Partnership grants. So far, more than 80 teachers have completed STEM-based master’s degree programs at AU at no cost to them. The university has also been holding regular workshops that have trained 160 mathematics and science teachers who serve 35,700 students in nine school districts. The success of these programs can be attributed to a genuine partnership the university has built with the school districts and community organizations, all of whom realize the importance of improving STEM education. The programs have been designed and delivered in a collaborative manner, and the partnership school will be no different. This effort is attracting national attention as U.S. educators seek ways to prepare our students for 21st century jobs. Aurora University will continue to make STEM education a top priority as we seek to create a model that can be replicated across the country. 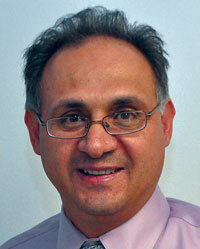 Saib Othman is the Interim Dean of the College of Arts and Sciences. He can be reached at sothman@aurora.edu.